2010 had been a very good year for Bruce H. Kramer. But what began as a floppy foot and leg weakness led to a shattering diagnosis: he had amyotrophic lateral sclerosis. ALS is a cruel, unrelenting neurodegenerative disease where the body’s muscles slowly weaken, including those used to move, swallow, talk, and ultimately breathe. There is no cure; ALS is a death sentence. When death is a constant companion, sitting too closely beside you at the dinner table, coloring your thoughts and feelings and words, your outlook on life is utterly transformed. The perspective and insights offered in We Know How This Ends reveal this daily reality and inspire a way forward for anyone who has suffered major loss and for anyone who surely will. Rather than wallowing in sadness and bitterness, anger and denial, Kramer accepted the crushing diagnosis. The educator and musician recognized that if he wanted a meaningful life, embracing his imminent death was his only viable option. His decision was the foundation for profound, personal reflection and growth, even as his body weakened, and inspired Kramer to share and teach the lessons he was learning from ALS about how to live as fully as possible, even in the midst of devastating grief. At the same time Kramer was diagnosed, broadcast journalist Cathy Wurzer was struggling with her own losses, especially the slow descent of her father into the bewildering world of dementia. Mutual friends put this unlikely pair—journalist and educator—together, and the serendipitous result has been a series of remarkable broadcast conversations, a deep friendship, and now this book. 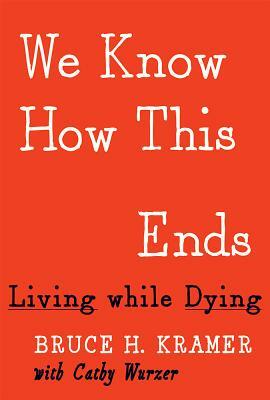 Written with wisdom, genuine humor, and down-to-earth observations, We Know How This Ends is far more than a memoir. It is a dignified, courageous, and unflinching look at how acceptance of loss and inevitable death can lead us all to a more meaningful and fulfilling life.